U.N. report finds sexual exploitation by U.N. peacekeepers is commonplace. 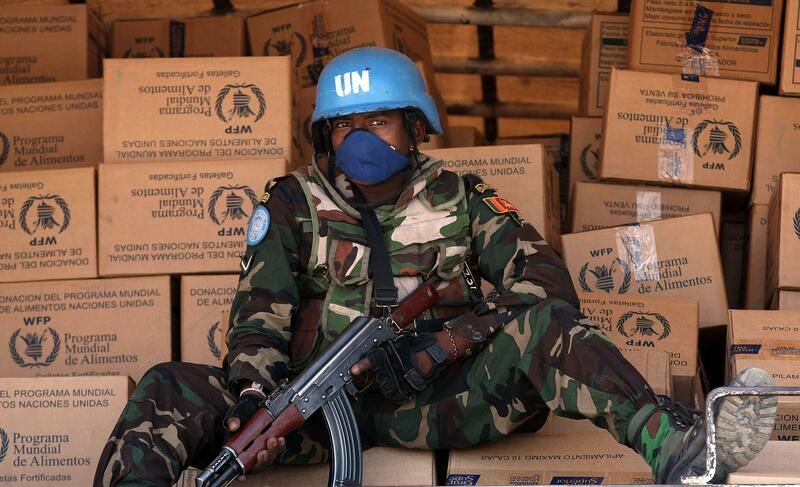 A U.N. peacekeeper guards food supplies on January 17, 2010 in Port-au-Prince, Haiti. A year ago, the report says, investigators interviewed 231 people in Haiti who said they’d had transactional sexual relationships with U.N. peacekeepers. “For rural women, hunger, lack of shelter, baby care items, medication and household items were frequently cited as the `triggering need,’” the report says. Urban and suburban women received “church shoes,’ cell phones, laptops and perfume, as well as money.